International flight arrivals. Private transfer to hotel. Full-day tour including gold museum, Botero gallery and Monserrate. La Candelaria is Bogota’s heart and soul, from its humble beginnings this is the oldest part of the city and the Plaza Bolivar (Main Square) are high on any visitor’s agenda. The Square is the focal point of this historic part of the city. As you wander the streets of La Candelaria away from the main square, your guide will not only explain the history of Bogota but also the intricacies of current Colombian culture and daily life. There will be time for a refreshment stop in one of the cities coffee houses. With your guide the next stop will be the Gold Museum which is situated on the northeast corner of the Parque Santander. The Museum is within the premises of the Banco de la Republica, and is one of the finest collections of Pre Hispanic gold in the world. This is a “must see” when in Bogotá, with more than 35,000 pieces of pre-Colombian gold work in the collection. Many of the works are said to be unsurpassed by goldsmiths of today and it’s easy to understand when you allow yourself time to study examples such as the Balsa Muisca (Offering boat). This golden raft is one of the focal point of the display and was the driving force in the Spaniards quest to find El Dorado. A short drive or interesting walk from the centre of the old town takes you to the base of the hill that leads up to the hill top view point and monastery of Monserrate. The summit can be reached by either funicular railway or cable car. From the highest point the view across the city will enable you to see the different sectors of Bogota. From La Candelaria and its terracotta tiled roofs to the high rise business sector and then on across the sabana (flat plains) and off in to the distance. The new convent is a pilgrimage site for many Colombians whom make their way past the fourteen Stations of the Cross until reaching the convent. Tour to Zipaquirá including Salt Cathedral- For some this is a religious monument, others a celebration of engineering or maybe even an artistic masterpiece. One of the marvels of Colombia, the Salt Cathedral of Zipaquirá is well worth the visit. For the beauty of its landscapes, the richness of its earth and the hidden jewel beneath the earth’s surface, Zipaquirá is somewhat of a must during a stay in Bogotá. The subtle lighting pronounces the fourteen Stations of the Cross as you descend in to the mine, each station sculpted by a different artist. At the deepest point of the cathedral, 180 m below the earth’s surface, you encounter the nave and the north and south aisles dominated by the 16m high central cross. The illumination and execution of the work is a tribute to modern techniques and years of work from the miners and artists. Your guide will explain all about the cathedrals construction and how it and the mine still function in harmony. However you view this construction, you can’t fail to be impressed by its size and grandeur. Around the central square of the town of Zipaquirá the colonial buildings still hold their charm footed by brickwork paving and overlooked by the Cathedral Diocesana de San Antonio. After the tour the rest of the day is for leisure time. Explore more of the caves or visit the towns and see what they have to offer. Domestic flight: Bogotá – Pereira. 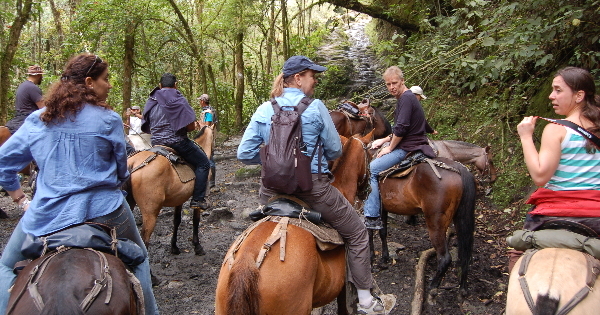 You will be met in Pereira and have a private transfer from airport to hotel. Half day coffee tour -Coffee makes this region tick; it’s the heart and soul of the region and its culture. This journey will take you through some stunning scenery, carpeted rolling hills of lush green coffee, plantain and yucca. Before you even arrive you will have been part of the tapestry of this enchanting region. As campasinos (local rural workers) pass by on their way to work in the fields, and children walk to school or wait for the morning bus, you can start to imagine how life is for these rural Colombian populations. Today is time to see the plant that keeps the world energised up close and personal. With a tour of one of the regions coffee plantations we see the whole process from seedling to coffee cup and every part in between. We learn about the trials and tribulations that face the regions coffee growers and how their whole way of life is affected by this simple bean. From the planting to the picking to the toasting and the tasting your life as a coffee drinker will never be the same, once you have tasted the elixir of life from Colombia. Full-day tour of Filandia, Cocora Valley and Salento This tour takes in the culture of the region along with the stunning natural beauty of the Cocora Valley. This tour will take you from the far northeast of Quindío to the beautiful Valle Cocora where the magnificent Wax palm grows, in one of its few natural habitats, then onto the first settlement in Quindío of the modern era. As you enter into Filandia, the first stop, you know you are in the Coffee A coffee break in one of the many small coffee shops will allow you to take in the quaintness of uninterrupted lines of brightly painted houses in this traditional Pueblo of the region. The guide will explain about the culture and people of the region and how small pueblos (Villages) like this form the back bone of rural agricultural life, if you want to feel like you are seeing Colombia then look no further. From Filandia you will drive to the Valle Cocora (Cocora Valley). Part of the wider Parque Nacional Los Nevados, the valley is located on the eastern limits of Quindío along the central Andean range. The valley has a unique landscape like a lush version of a Swiss valley. It has been regarded by Colombia as a sanctuary for its national symbol; the Wax Palm (Ceroxylon quindiuense). The Palms cover the Mountain range, which is now protected and declared monument to protect the tree itself and the endemic species that depend on it. The valley is spectacular and great for walking or horseback rides, either way this stunning mountain scenery will not fail to impress. Salento is a municipality in the north eastern part of the department of Quindío. It was the first settlement in Quindío of modern times dating back to 1850, and the first municipality founded in the department. This picturesque town boasts a number of fine houses of traditional architectural style. Rimmed by distant snow capped mountains Salento has a real rural traditional feel. Half-day gastronomical experience- Your day starts with the new exclusive Gastronomic Experience based in the World Heritage Site of Colombia’s Coffee Region. The tour starts with a visit to a local food market which specializes in organic products. You will be accompanied by your bilingual guide and the chef of Bakkho restaurant which is located in the department Quindío. Bakkho is a local favorite and one of the region’s best restaurants serving local dishes in its own unique style. You will experience the work of the local people and their produce, their daily routine and learn about the variety of different products from native meats, fish, vegetables and exotic fruits. Your private Chef will reveal stories and tricks of the trade in the market where every day all the fresh ingredients for the recipes prepared by the chef and her team are bought. Leaving the market you will be taken to the restaurant and there you will be taught how to cook a dish which combines typical ingredients from the Coffee Region and Colombia with the international cuisine. You will be rewarded by sitting down at your table to enjoy your own work in the colonial surroundings in the restaurant which was declared part of the architectural and cultural heritage which dates back over 105 years of history. The rest of the day is for leisure time where you can explore the town and see what it has to offer. Half-day walking tour Carved from a colourful history rife of piracy, Sultry Caribbean heat, with fusions of African, indigenous and European culture, Cartagena is Colombia’s living, breathing and pulsating museum. Absurdly photogenic La Heroica (Heroic city) awards even the laziest of travellers. Colour splashes every corner, balconies overflow with blossom, and energy seeps beneath the ancient wooden doors of hotels, restaurants and Casa Privadas. Your tour will take through the old town under the Puerta Del Reloj (Clock tower entrance), a symbol of Cartagena, into the Plaza de los Coches. Your guide will divulge the myths and legends, histories and stories of Cartagena from ancient times right up to the present. From the Plaza San Pedro Claver with its stunning Church, on through to the Plaza Bolivar; with its shady areas, where a fresh Lemon juice can be enjoyed while watching the world go by. Day at leisure in Cartagena You will have plenty to keep you occupied with a free day in Cartagena. The streets are alive with life and people watching is an endless activity. This can be done strolling the cobbled streets or from the comfort of a local restaurant with cool fruit juice in hand. Cartagena is an attraction in itself, but there are also plenty of local shops to occupy even the most ardent shopper. If you fancy a good walk (or taxi if you don’t) a trip down to the beaches of Boca Grande will let you soak up some sun and see how the locals enjoy their city beach. Departure Private transfer from your hotel to airport for return flight home.